Beautifully presented over three floors, this five bedroom semi-detached house boasts expansive and modern interiors, offering two sleek en suites and two family bathrooms and provides off-street parking and a garden. Located on Vivian Way, the property is close to a wide selection of shops and amenities in East Finchley, while both Highgate Wood and Hampstead Heath are close by. Transport links include East Finchley Underground Station (Northern Line). 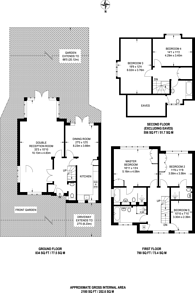 2,180 (202 Sq M) approx. We have over 1,000 property market reports for locations across London and Surrey - including N2 and Hampstead Garden Suburb.